I mentioned that I was going to get some PS fuel addtive and my farmer buddy gave me this stuff instead. It is made by Bear Dearborn and is sold under then name Index OTR Plus 2, with the following second title: 20 Below Winter Diesel Premium. It is in a 2.5 gallon container and is meant to treat a 2000 gallon tank of number 2 diesel and reduce gell point by 20 degrees. In extreme winter conditions it recommends a slighly stronger 1 to 1000 gallon ratio. in number. I guess thta would be wax? The fuel is not cloudy but not quite as easy to see through as when it is room temperature. No sediments or globules in the liquid. Minus these few surface fleks the liquid seems consistent from top to bottom. How does it seem to be? At -10 this would seem like a good performance to me but I am no expert. Use what you know has worked for you in the past. Now is not the time to be experimenting with something that has no track record. The flakes you see are wax crystals and the fuel is more than likely near the cloud point. I mentioned the conversation I had with my oil dealer in another post. If he's right, summer blend #2 plus additives does not necessarily make a reliable winter blend #2. I also know that my dealer sells different products to people with inside and outside furnace tanks but both are called furnace oil, which is similar to #2-diesel. The oil sold for inside tanks will gell outside. What I do to make winter blend for here is to start adding #1-diesel (stove oil) to any left over summer blend #2 in the fall. By this time of year I have mostly straight #1 in the tractor and storage containers. Some tractors may not tolerate 100% #1 very well but my dealer said that either works OK in my Ford. I believe the higher sulfur content of #1 diesel fuel compared to kerosene intended for lamps and heaters is better for the engine. I don't think I'd like to be looking at cloudy fuel this time of year--it got below -30F here last week. I don't know if adding #1 helps fuel that's already clouded but I'm pretty sure that additives don't. "Use what you know has worked for you in the past. Now is not the time to be experimenting with something that has no track record. The flakes you see are wax crystals and the fuel is more than likely near the cloud point." True, I suppose I could experiment with the fuel mixture in July, but that wouldn't prove much about it's cold weather driveability now would it Chief Really though, I understand what your saying, but the tractor isn't mission critical right now with no REAL snow forcast. I ran out of fuel so I figured what the heck. If the tractor did gell up it wouldn't be that bad. 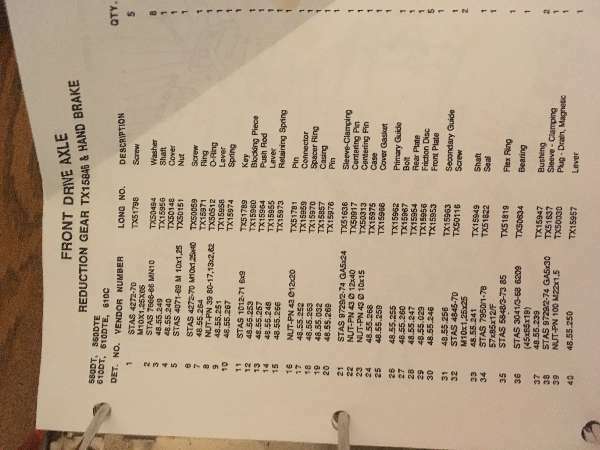 It's pretty easy to add 911 or even remove that fuel filter. Draining the 5 gallon tank is no biggie if things were real bad. Now a similar experiment in the PSD would NOT be fun! From what I saw this fuel would seem to be fine down to at least -10F, that is slightly lower than the coldest temps we really ever see. I will double dose and I feel pretty good that there will be no problems. The stuff was still very thin and clear. I will try the same with the pump fuel and some additive and see what the difference is. I have a feeling the results may not be that different, I have REALLY GELLED winter fuel at +5F! There doesn't seem to be any wax in the rest of the fuel, even if I splash some up on the side of the jar it's clear. It is possible that minute flecking on the surface is moisture that froze out of the trapped air in the jar. When I was checking it out, I breathed a little on the surface and I could see the ice come off my breath as it froze when hitting the surface. Guess I just need to keep and eye on it and see how it works. I think they only thing I've ruled out is that it will be a BAD gelling problem. Right now I am either good at or borderline at -10F which is 5 degrees lower than our lowest temp this and most years. I am going back to my buddies farm and I will ask how this stuff works with his HH oil. He has MANY tractors so I'll inquire about gell-up frequency if there has been any. I can't find much about this particular additive. I did find a document on some similar type of additive Bear Dearborn made for U.S. military jets. To be honest the stuff I have smells like PowerService but is MUCH thicker and a little darker in color, probably due to it's much higher concentration. Lawman..... based on my experience in conducting scientific experiments in the kitchen I would say you are skating on thin ice here buddy. Does "she who must be obeyed" know what you have in her freezer? I am still in trouble for using the gravy jar to save some interesting trout parasites, and that was over twenty years ago. "Lawman..... based on my experience in conducting scientific experiments in the kitchen I would say you are skating on thin ice here buddy. Does "she who must be obeyed" know what you have in her freezer? I am still in trouble for using the gravy jar to save some interesting trout parasites, and that was over twenty years ago." Scott, you have a point there. I was thinking about when you told me about the fuel gelling in your truck when I posted that and from what I heard; it is COLD up there. Gelled fuel in the truck = RPITA. At least in my Cummins it is. The tractor probably would not be so bad. By the way, I have read that additives like Stanadyne will freeze solid or gell up in the bottle but not when it is mixed with diesel. Go figure. How have you been doing lately? Haven't seen you post much here lately. "Have seen you post much here lately"
Everyone is better now but the wife and I look and feel like POWs. You just can't have this real bad strain of flu and be running around in -5F. The only upside was that on a whim I double insulated my yard hydrant just before the freeze was forecast, so at least it didn't freeze like last year. If we had to haul water that might have been the final straw! As far as the additives, it is funny how they gunk up in the cold if they are not mixed with fuel. The tractor is running fine on the HH oil with the additive but it's only in the 20's. May actually run quieter on this stuff then the winter pump blend???? While we were sick the stalls just didn't get done well so we stripped them and I just hauled a HUGE trailer of manure to the woods. The trailer was full before I added to it today. This was the most I ever pulled with the tractor, the cart was literally overflowing. I need a truck scale Not being sure of the temps this week I wanted to get this stuff to the woods while the field was still nice and frozen. Scott, real sorry to hear of your flu epidemic. Glad to hear you are all much better now. We went through a bout of something like that earlier in the Fall. Just a suggestion on the block heater. Mine was not working right either earlier this last Fall and it turned out the electric cord was the problem and was not tightened up all the way. I checked again the other day and a quarter turn out of it tightening it down again. It is in tight spot that makes getting a good grip on it difficult. Thanks, so you guys had it too this season. This seasons flu was no JOKE. I don't normally get the flu, but you can see how so many young and old people succumb to it yearly. That's a good idea about the cord. My first thought was that the metal prongs were all oxidized looking so I buzzed them with a wire brush on my DeWalt cordless, no joy. I will do as you suggested and see if the cord is good all the way to the element. My backup plan if she wouldn't turn over was a very small 1500 watt space-heater right on the radiator blowing on the motor fro an hour. I was going to leave the hood open about 6" (to fit the heater) but use a blanket to tent the motor and keep the heat in while directed it at the motor. My buddy gave me this 6' x 6' cloth tarp that the utility companies use to cover high voltage wires from sparking on them. It isn't asbestos but it is very stiff and fire proof. It's almost like a kevlar type of material. I will try your idea and if taht's not it I'll price a new heater from International, as Ford will surely be twice as much $$$$ She starts reliably without being plugged in but being sick I let her sit for a few days and the record lows were a bad coincidence.